Q: We have noted that on December 13, US National Security Adviser John Bolton made some remarks to criticize China when announcing the US administration's new Africa Strategy. A lot of people in the US and many African countries criticized that. Some US officials and research institutions pointed out that China's infrastructure constructions in Africa have met Africa's most urgent needs for development and that US criticism on China-Africa cooperation just makes itself unwelcome and is not worth the candle. They believe that the tone of Bolton's speech is too negative and confrontational. The US Africa policy should not be aimed mainly to attack China. If the US competes with China with such kind of mentality, the US is doomed to fail. Many Zambian senior officials asked Bolton to take back his erroneous remarks. A Tanzanian senior official said that China-Africa relations are underpinned by brotherhood and based on mutual respect. For people who complain about China-Africa relations, are they willing to make great sacrifices for the independence and development of African countries as Chinese people have done? What is your response to that? A: I have noted relevant reports. The new US Africa strategy and the relevant remarks made by the US official you mentioned have aroused such widespread doubt and criticism from the international community and even people in the United States. The relevant US official should indeed reflect on that. When conducting cooperation with Africa, China always follows the principles of sincerity, real results, amity and good faith and upholding justice while pursuing shared interests. At the 2018 Beijing Summit of the Forum on China-Africa Cooperation, President Xi Jinping outlined China's "five-no" principle in developing relations with Africa: no interference in African countries' pursuit of development paths that fit their national conditions; no interference in African countries' internal affairs; no imposition of our will on African countries; no attachment of political strings to assistance to Africa; and no seeking of selfish political gains in investment and financing cooperation with Africa. This establishes a benchmark of self-discipline in China's cooperation with Africa and demonstrates the code of ethics for international development cooperation. No one knows better than the African people as to whether the China-Africa friendship is true or not, whether China-Africa cooperation is for real benefits or not, and whether China's assistance to Africa works well or not. The US side should think about whether its new Africa strategy is designed to promote Africa's development or target China-Africa cooperation. If it is the former one, China and the US can leverage their respective strengths to jointly support Africa's development. If it is the latter one, I believe that the African people are sharp-eyed and the US will be not only asking for a snub but also inviting humiliation. Q: The fourteenth review of the US trade policy is taking place at the World Trade Organization. We noted that on the first day of the review, 40 members have submitted over 1700 written questions. Sixty-four members voiced their concerns over the US policy measures in their addresses, including obstructing the selection of the members of the Appellate Body and increasing tariffs on steel, aluminum and automobiles under the pretext of "national security", asking the US to engage in the multilateral trading system in a constructive manner and play a positive role. The EU ambassador to the WTO said that the WTO is in a deep crisis and the US is at its epicenter. What's your comment? A: As to the ongoing US trade policy review at the WTO, China's Permanent Representative to the WTO, Ambassador Zhang Xiangchen, has made an impressive and eloquent statement to elaborate on China's clear position and attitude. As you said, in this trade policy review, representatives of many WTO members have expressed their concerns, worries and criticism over the US unilateralism and trade protectionist policies. We hope the US will conscientiously heed the call of the WTO members with an open mind, earnestly shoulder its responsibility, and faithfully fulfill its obligations under the multilateral trading system. 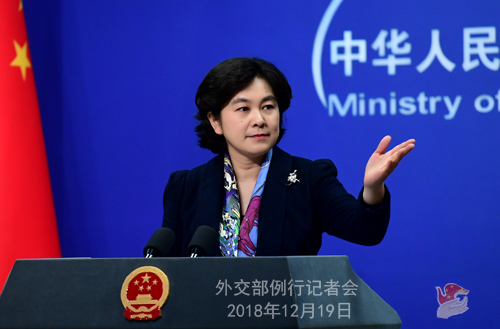 Q: The Commerce Ministry said about an hour ago that there was a phone call between Chinese and US vice-ministerial officials. Could you give us more details? Who were on this call from the Chinese and US sides? What was discussed? A: I have noted that China's Commerce Ministry has released a brief piece of readout. I am not aware of the specifics and I would refer you to the Commerce Ministry. Q: The National Post in Canada reported that a third Canadian has been detained in China. Can you confirm this and offer more details? A: I am not aware of the situation mentioned by you. The Chinese competent authorities previously have taken compulsory measures in accordance with the law against two Canadian nationals, Michael Kovrig and Michael Spavor, who are suspected of engaging in activities that endanger China's national security. We have elaborated on the relevant situation. Follow-up: So you cannot confirm that? You have not heard of any information? A: No, I have not heard of that. Q: Some analysts think that President Xi Jinping in his speech yesterday did not mention the influence of market economy on the reform and opening-up or put forth the new goals for the reform and opening up. What influence will this have on the China-US trade talks? A: Yesterday, the full text of the important speech delivered by President Xi Jinping at the gathering in celebration of the 40th anniversary of China's reform and opening up has already been posted online. I hope that you can have a careful reading of that. President Xi Jinping took stock of the achievements of China's reform and opening-up in the past four decades in an all-round and profound manner and charted the course for China's development in the future. We all feel heartened by that speech. I believe that it can help the international community to get a better understanding of where China came from, where it now stands at and where it is heading for, which will also boost the confidence in China's development prospect. The China-US trade talks are being advanced by the economic teams from the two sides in an orderly manner in line with the spirit of the consensus reached by the two heads of state at their summit. We certainly hope that the two sides can strive for win-win outcomes through consultations on the precondition of mutual respect, equality, good faith and matching words with deeds. Q: US President Donald Trump on December 18 signed a bill into law, approving the creation of the Space Command. This means the US has now officially set up a space force which is in charge of space affairs. According to a report by relevant US institution previously, such a move is aimed to guard against the military use of outer space by China and Russia. What's your comment? A: Outer space is all humanity's property. China always advocates the peaceful use of outer space and opposes the placement of weapons and an arms race in outer space. In particular, we oppose turning outer space into a new battlefield. We hope that the international community, in particular relevant major countries, will work together to earnestly uphold the lasting peace and tranquility in outer space. Q: According to reports, US Special Representative for Syria James Jeffrey said that the US would not seek to overthrow Bashar Assad's regime. Instead, the US will ask the Syrian government to make a complete change, otherwise Syria cannot get funds for reconstruction from the Western countries and their financial institutions. What is your comment? A: China always believes that the sovereignty, independence and territorial integrity of Syria should be upheld and respected and that the future of Syria should be independently decided by its people. The relevant parties to the Syrian issue should follow the spirit of the Resolution 2254 of the UN Security Council to advance the inclusive Syrian-led and Syrian-owned political process on the basis of respecting Syria's sovereignty, independence and territorial integrity. 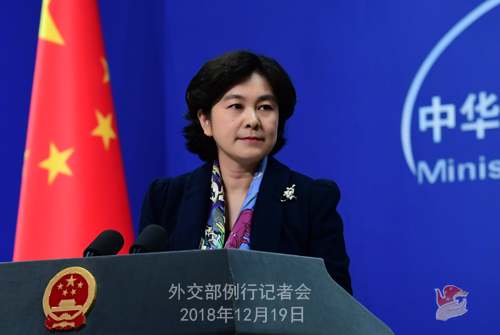 China stands ready to join hands with the international community to continue to play a positive and constructive role in promoting the proper settlement of the Syrian issue at an early date. Q: According to reports, while speaking at a press conference of the Africa-Europe High-Level Forum on December 18, President of the European Commission Jean-Claude Juncker claimed that Chinese aid contributes to a massive increase in debt among African countries in many cases. This is not happening in conjunction with Africa and Europe, and that is why they are better. What's your comment on this? A: China has always followed the principles of sincerity, real results, amity and good faith and upholding justice while pursuing shared interests when conducting practical cooperation for mutual benefits and win-win results with African countries. Such cooperation has provided strong support to economic development and the improvement of livelihood in Africa, which is widely applauded by the African people and recognized by the international community. There is not any African country saddled with debts due to its cooperation with China. The issue of African countries' debts is a product of the unjust international economic order. What is the cause of the debts issue in some African countries? Who are the major creditors? The facts are just clear-cut. We hope the relevant side will do what they should do and earnestly increase their support to Africa's economic development. 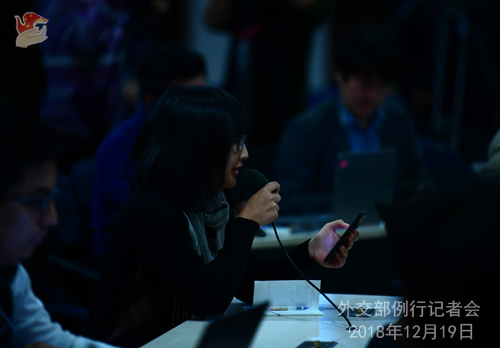 Q: Huawei yesterday received foreign journalists and answered their questions. 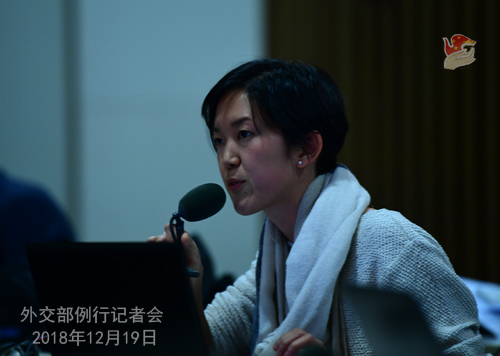 Do you think this will help resolve the case of Meng Wanzhou? 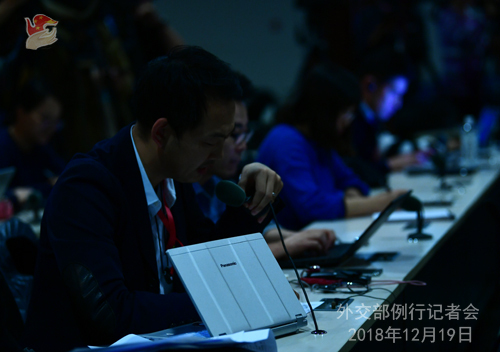 A: Huawei's briefing on the company for foreign journalists will help people to get a better and all-round understanding. You may refer to Huawei for the specifics. Many are concerned about Huawei recently. As the world's largest telecom equipment supplier, Huawei has good cooperation with many countries around the globe. The quality, credibility and reliability of its products have been widely and fully recognized by its cooperation partners. No one is able to give any evidence that Huawei has posed any security threats as certain countries or people have claimed. Despite not having any factual basis or solid evidence, certain countries have politicized normal development of science and technology and cooperation, slandered and suppressed Huawei and other Chinese high-tech companies on such unwarranted charges as "possible security threats" and with presumption of guilt. This is in essence a flagrant practice of hegemony in science and technology as well as trade and investment protectionism, which also breaches the WTO rule of non-discrimination. 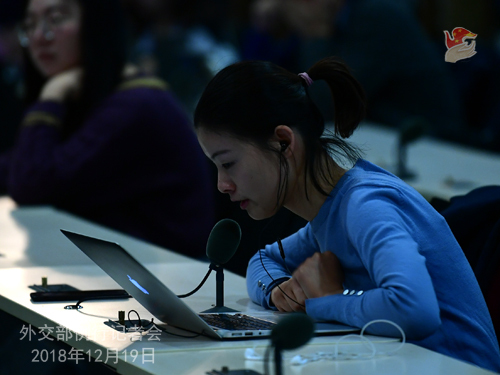 China's right to development, including that of Chinese high-tech enterprises should be fully respected. Relevant parties should be clear that any slander or attack will never stop Chinese enterprises' steps towards growing and going global. Q: I have two questions. First, a Vatican delegation came and met with Chinese bishops recently. Do you have more details to share? What were discussed? Second, Germany is tightening rules on national security investigations over non-EU shares purchases. Some say this is because of growing disquiet over takeovers by Chinese firms. For example, Midea took over Kuka. What is your comment? A: Regarding your first question, China is always sincere about improving its ties with the Vatican and has been making unremitting efforts in this regard. China and the Vatican signed the provisional agreement on the appointment of bishops in September this year, which represents an important outcome in the process of improving our bilateral ties. The two sides will maintain communication to implement the relevant spirit of the agreement. With regard to your second question, as far as I know, the ongoing discussions in Germany and the actions it might take are not explicitly targeted at specific countries or companies. Now China-Germany relations are developing with a sound momentum. During the Fifth China-Germany Intergovernmental Consultations in July this year, the two sides issued a joint statement which lays emphasis on opposing all forms of protectionism. In the face of the complicated situation where protectionism and unilateralism are surging, all relevant parties, when rolling out relevant policy measures, should avoid sending out the wrong signal to the outside world. As two major economies in the world, China and Germany should shoulder the responsibility to jointly uphold free trade and multilateralism and inject positive energy into bilateral high-level mutually beneficial cooperation and safeguarding an open world economy through expanding opening-up to each other. We hope that Germany can create a fair and open market access environment and stable system framework for the investment of Chinese enterprises and other foreign enterprises there. Q: Japanese Defense Minister Takeshi Iwaya inspected the Izumo for the first time after he took office. What is China's comment on his inspection of the Izumo and the upgrading and modification of the ship? A: I already answered questions regarding this issue yesterday. I would like to reiterate that due to what happened in history, Japan's moves in the field of military security have been closely followed by its neighboring countries in Asia and the international community at large. We urge Japan to earnestly learn lessons from the history, adhere to the strategy of "purely defensive defense", stay committed to the path of peaceful development and act cautiously in the area of military security.